I recently had a dessert epiphany- what would happen if I combined apple pie and chocolate chip cookies, two of my favorite treats? Without quite knowing what I was doing I whipped up this crazy combination and the result was delicious! Basically, you prepare the apples as you would an apple pie or apple crisp, using your favorite recipe. Then you layer them in a baking dish and top with cookie dough. Its pretty simple, but here are the details of my version. Preheat oven to 400. Mix sliced apples with lemon juice. In separate bowl mix brown sugar, flour, spices and corn starch. Combine. Butter a baking dish. Fill dish with apple mixture. Top with cookie dough. 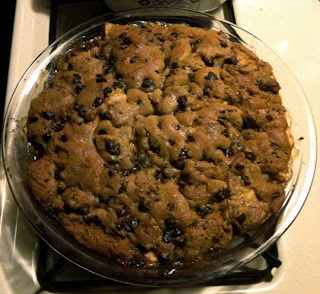 For the topping, you just need to work the cookie dough into flat pieces and place over the top of the apples. I pretty much made an almost solid sheet of cookie dough, approximately 1/2" thick. First you need to cook the apples without burning the cookies. I covered the dish with aluminum foil and baked until the apples got bubbly, approximately 30-40 minutes. I would recommend setting a timer for 30 minutes, then every 10 minutes until they are cooked. Remove the foil, turn down the temp to 350 and cook for about 10 minutes until the cookie dough sets and topping is brown. Please note, these times and cooking temperatures are approximate. As much as you will want to eat this right away, you should let it sit for a few minutes so the juice can coagulate a little and it will be easier to serve. Top with whipped cream, ice cream or both. Enjoy! OMG-OMG-OMG, why don't I live closer!?! I SO want a piece of this RIGHT NOW! Guess I'm going to have to make my own. :) Thanks for the recipe.